Determining the right amount to add, to a Pool or Spa. Water Chemistry Is The Key To Pool or Spa Water Quality. Scroll down to browse through some pool and spa information, relative to Calculating Chemical Additions. Please click the Pool Problems Link, on top of every page, to access a complete listing of Pool Problem subjects, an alphabetized Website Table of Contents, Pool Equipment Information, About Alan Biographic Material and a Pool Glossary. Use the other links to access additional subject information. More information about some new and unique products, for pools and spas, can be found by visiting The Website Store. You'll never know what you'll find and that's always fun. Be better prepared and avoid costly problems! Testing water is an integral part of pool and spa water management. Reliable and accurate results are important, in order to maintain proper water chemistry. A ColorQ, all digital Water Tester can perform all of the common tests, while eliminating the color-matching and guesswork. With 10 models, performing up to 11 different test factors, one is right for every need. 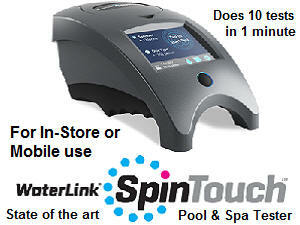 The WaterLink SpinTouch Labs are the ultimate tester, doing up to 10 different water test factors, in just 1 minute. A PockeTester Kit is a convenient way to monitor the salt level, as well the overall water chemistry. Water chemistry is where the path to proper water quality, clarity and sanitation starts. Water testing provides the basis for determining which chemicals are required to correct and optimize chemical concentrations. The proper maintenance of the pool water is an ongoing responsibility and not something to be taken for granted. 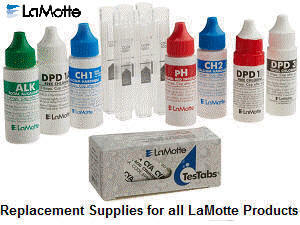 Having the right water testing equipment will make the task easier, save money on chemicals and help avoid problems. Become better informed and take charge of your own water quality! Proper chemical and maintenance practices will help reduce chemical expenses and even help reduce the energy costs. Savings that will enable you for better enjoy your pool. If problems arise, refer to the Pool Problems Page or Spa Problems Page, as a source of problem-solving information, broken down into various categories. Scroll down the page and click on the linked keywords or catch phrases below, to access additional information, on that topic or product. Do you know what's in your water? If you're having problems, with water clarity or quality, testing allows you to better understand the chemistry and determine the cause of the problem. Once understood, you can select the best treatment option. Understanding the nature of the problem, should be step one. For information about our full selection of testing options, visit our Test Equipment Store. Unsure about your pool or spa capacity (gallons or liters)? Need conversion to metric units? Need a Water Analyzer to suit your particular needs? pH (Chlorine) 7.2 - 7.6 7.2 - 7.6 too high or too low Add acid or sodium bisulfate to lower. Add soda ash to raise. pH (Bromine) 7.2 - 7.8 7.2 - 7.8 too high or too low Add acid or sodium bisulfate to lower. (Active Germicidal Form) 1.5 - 3 PPM 1.5 - 3 PPM over 5.0 PPM Too low add chlorine. Too high cut back on chlorine additions. (Total minus Free Chlorine) 0 - 0.3 PPM 0 - 1.0 PPM over 1.0 PPM Too high superchlorinate. (Free plus Combined Chlorine) 1.5 - 3 PPM 1 - 3 PPM over 3.0 PPM Too high cut back on chlorine additions. Superchlorination 10 PPM 10 PPM n/a How much will be required depends on product used and pool condition. Too high cut back on bromine additions. 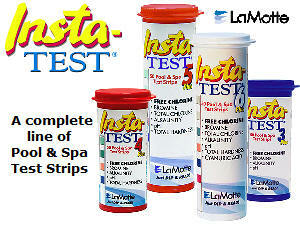 Total Alkalinity, PPM 80 - 120 PPM 80 - 180 PPM over 180 PPM Too low add sodium bicarbonate. Too high consider adding acid. Calcium Hardness, PPM, (Vinyl) 80 - 120 PPM 80 - 400 PPM over 400 PPM Too low add Calcium chloride. Too high add sequestering agent. Calcium Hardness, PPM, (Gunite) 150-200 PPM 150-400 PPM over 400 PPM Too low add Calcium chloride. Cyanuric Acid, PPM, (Frost belt) 20 - 40 PPM 20 - 150 PPM over 150 PPM Too low add Cyanuric Acid. Too high replace some water. Cyanuric Acid, PPM, (Sun belt) 40 - 60 PPM * 40 - 150 PPM** over 150 PPM Too low add Cyanuric Acid. Iron, PPM 0.0 PPM 0.0 PPM any measurable amount Add metal treatment. At least one dose per 0.5 PPM. (with pH favoring 7.2) over 0.3 PPM Follow manufacturer's instructions. (with pH favoring 7.2) over 0.3 PPM Add metal treatment. At least one dose per 0.5 PPM. Nitrates, PPM 0 - 10.0 PPM 0 - 40 PPM over 40 PPM No practical solution. Removing phosphates mitigates their presence. Phosphates, PPB 0 - 100 PPB 0 - 250 PPB over 250 PPB Phosphate removers are available. If untreated, higher chlorine usage results. no salt chlorine generator 300 - 2000 PPM 300 - 3000 PPM over 3000 PPM Replace some of the water. with salt chlorine generator 3000-4000 PPM 3000-5000 PPM over 5000 PPM Test salt level and consider replacing some water, if necessary. Recommendation Too high or too low. Add salt, if too low. Replace some water, if too high. Biguanide, PPM 30 - 50 PPM 30 - 50 PPM Too high or too low. Add Biguanide, if too low. Biguanide Shock, PPM Suggested application is 1-quart per 7500 gallons. Enough has to be added to register a 5-10 PPM level and produce clear water. Varies with spa use. Too high or too low. Add Biguanide Shock, if too low. * Cyanuric Acid levels over 50 PPM are not likely to provide any additional benefit or protection. ** Cyanuric Acid level over 50 PPM require increasingly higher amounts of free chlorine, to provide the same degree of sanitation, as when the CYA levels are closer to 50 PPM. Levels as high as 150 PPM will require water replacement, to lower the cyanuric acid level to something closer to 50 PPM. Raising or lowering the pH will, will usually, move the Total Alkalinity in the same direction. It is not always practical to get both parameters within range. pH is always more important! If the pH is in range and the TA is higher, it may not present problems, so long as the water is clear and there are no signs of scaling. The higher the TA, the more stable the pH becomes, and the more chemicals will be required to move it, in any direction. A high TA and an acceptable pH is not a problem, so long as the water is clear and there are no signs of scale formation. The lower the TA, the less stable the pH becomes, and the easier it moves up or down. Having the right tester will make your test results more reliable and make maintaining the water chemistry easier and less expensive. These amounts are just guides. Your pool or spas could require more. or less, based on the overall sanitizing method. Remember, you can add more - you can't take out. The above dosages are just a guide and your pool could require more or less. Pools with higher total alkalinities and TDS could require more. Add slowly in increments, in front of a moving return flow. Remember you can always add more - you can't take out! Go to the Chemical Safety Practices page, for more about proper procedures and handling. Larger or smaller pools or spas, use proportionate amounts. The above dosages are just a guide and your pool could require more or less. Pools with higher total alkalinities and TDS could require more. Add slowly in increments, in front of a moving return flow. Always add the acid to the pool water. Go to the Chemical Safety Practices page, for more about proper procedures and handling. Larger or smaller pools or spas, use proportionate amounts. Raising or lowering the Total Alkalinity will move the pH in the same direction. It is not always practical to get both parameters within range. pH is always more important! Low TA makes the pH less stable. High TA makes the pH more stable, but can lead to scaling issues, if the calcium hardness is over 400 PPM. If the calcium hardness is too high, a TA closer to 80 PPM should be of benefit. If the TA is high and the pH is within range and the water is clear, without any signs of scaling, there is no compelling reason to have to lower the TA. Attempting to do so, may prove futile. To get a truer TA reading, you should subtract 30% of the Cyanuric Acid test reading, from the TA reading. Having the right tester will make your test results more reliable and make maintaining the water chemistry easier and less expensive. These amounts are just guides. Your pool or spas could require more. or less, based on the overall sanitizing method Remember, you can add more - you can't take out. The above dosages are just a guide and your pool could require more or less. Add slowly in increments, in front of a moving return flow. To obtain a truer TA reading, subtract 30% of the Cyanuric Acid reading from the TA reading. Remember you can always add more - you can't take out! Go to the Chemical Safety Practices page, for more about proper procedures and handling. Larger or smaller pools or spas, use proportionate amounts. Your pool or spa could require more. or less, based on the overall sanitizing method. Having the right tester will make your test results more reliable and make maintaining the water chemistry easier and less expensive. High levels of calcium hardness can lead to cloudy water, scaling, heater and filter issues. Low calcium hardness, in gunite pools can lead to etching of the surface and problems with the appearance of the finish. Calcium may be present in source water to varying extents. The use of calcium hypochlorite, as a chlorine source or shock treatment, will increase the hardness of the pool water, over time. These amounts are just guides. Your pool could require more or less, depending on the accuracy of the test. Remember, you can add more - you can't take out. The above dosages are just a guide and your pool could require more or less. Add slowly in increments, in front of a moving return flow or by broadcasting across the surface. Vinyl and Fiberglass pools can do well with lower levels, as their walls are not made of masonry materials. Gunite pools should maintain a higher level, to help protect the walls and minimize the tendency of the pH to rise, as calcium dissolves from the plastered surface. High pH and/or TA make cloudy water more likely, as this chemical is added. Larger or smaller pools, use proportionate amounts. Lowering Calcium Hardness can be done, by replacing some of the water with softer water. Adding 1 pound of Tri Sodium Phosphate (TSP), per 10,000 gallons of pool water, will drop the calcium harness by 11 PPM. However, this will cause cloudiness, a major amount of cleaning of the pool and filter and the possibility that any lingering phosphates will promote algae growth. Calcium sequestering agent are another choice for dealing with high calcium levels. Go to the Chemical Safety Practices page, for more about proper procedures and handling. Larger or smaller pools or spas, use proportionate amounts. Your pool or spa could require more. or less, based on the overall sanitizing method. Having the right tester will make your test results more reliable and make maintaining the water chemistry easier and less expensive. Cyanuric acid is only used in chlorine-maintained outdoor pool and helps to make the chlorine lake longer, by protecting it from the Sun's UV rays. In northern areas a range of 20-40 PPM is recommended. In the Sunbelt, a higher range of 40-50 PPM is preferred. Levels above the ideal are not a problem until they reach 150 PPM. At high levels cyanuric acid makes the chlorine less effective and forces to pool owner to maintain a higher free chlorine level. The only way to lower a high level is to replace some of the water, preferably in increments, to avoid damage to the pool. These amounts are just guides. Your pool or spa could require more or less, depending on the accuracy of the test. Remember, you can add more - you can't take out. THIS CHEMICAL IS NOT REQUIRED IN SPAS THAT ARE COVERED, MOST OF THE TIME. The above dosages are just a guide and your pool should require these amounts, providing the testing was reasonably accurate. Add slowly in increments, in front of a moving return flow or by broadcasting across the surface. Adding it very slowly, to the skimmer, is another way to add this slowly dissolving chemical. Pools that use Trichlor or Dichlor will find that their cyanuric acid levels will rise over time. If trichlor is used as the primary sanitizer, dichlor as a shock should be avoided, as it will only speed up the rise of the cyanuric acid level. Water replacement is the only means of lowering a high level. Go to the Chemical Safety Practices page, for more about proper procedures and handling. Larger or smaller pools or spas, use proportionate amounts. THIS CHEMICAL IS NOT REQUIRED IN SPAS THAT ARE COVERED, MOST OF THE TIME. Having the right tester will make your test results more reliable and make maintaining the water chemistry easier and less expensive. Which product to use is a matter of what is best for your water chemistry, as well as cost-effectiveness and convenience factors. Liquid chlorine is cost effective and adds no problematic byproducts, but is not necessarily convenient. Calcium hypochlorite is cost effective, but can add unwanted calcium hardness. Dichlor is convenient and easy to use, but tends to raise the cyanuric acid level. Lithium Hypochlorite is convenient, but less cost effective. These amounts are just guides. Your pool or spa could require more or less, depending on the state of the water quality. Remember, you can add more - you can't take out. Superchlorination is used to help destroy algae, restore water quality and to eliminate the odorous and irritating forms of chlorine. Boosting the free chlorine to 10 PPM, will destroy 1.0 PPM of combined chlorine. Combined chlorine is the difference between the Total Chlorine reading and the Free Chlorine reading. Test values under 0.3 PPM are indicative of good chlorine management. Reading between 0.3 and 1.0 PPM, indicate that more attention may need to be directed to the chlorine application rate. Readings over 1.0 PPM are likely to result in eye irritation and odorous conditions. Go to the Chemical Safety Practices page, for more about proper procedures and handling. Larger or smaller pools, use proportionate amounts. Your pool or spa could require more. or less, based on the overall sanitizing method. Having the right Salt and TDS Tester will make your test results more reliable and make maintaining the water chemistry easier and less expensive. High TDS could lead to water quality issues and might be treated simply by replacing some of the water. With a salt chlorine generator, it is important to monitor the salt level, to get optimum performance and help extend the life of the salt cell. Too low a salt level could make it difficult to maintain a proper free chlorine level and could shorten the life of the salt cell. Too much salt will shorten the life of the salt cell, make pH control more challenging and add to the possibility of corrosion and clarity issues. These amounts are just guides. Your pool or spa could require more or less, depending on the accuracy of the test. Remember, you can add more - you can't take out. Total Dissolved Solids (TDS) has to be separated into two categories. TDS that results from naturally occurring mineral salts, build up of chemical residues and waste from bathers. What is present in the source water may not be controllable and pool or spa usage will add to the TDS level. As this level rises to 2000-3000 PPM, the possibility exists that it will affect water clarity, scaling and sanitizer performance. Depending on the nature of the available replacement water, it may be difficult to drastically lower the level. High TDS that results, from the addition of the required amount of salt when a salt chlorine generator is used, presents a different problem. 2500-4000 PPM of salt may have to be added, depending on the manufacturer's recommendation, and does not present the same issues, unless the water was high in TDS before the salt was added. If that is the case, clarity, scaling and corrosion issues could present themselves. Addition of sequestering agents could help minimize problems and help keep the salt cell free of scale. Go to the Chemical Safety Practices page, for more about proper procedures and handling.